Does anyone know a good pattern or book for making Baltimore quilts? I am able to find them online, but I'm hoping for a recommendation from someone who has used a particular one. I don't usually use patterns, but I think I would have a hard time without one in this case. I shouldn't be looking at this because I've already got projects lined up that will last me at least a year, but I can't seem to help myself. You could try: Baltimore Beauties and Beyond by Elly Sienkiewicz. She is the "queen" of Baltimore album quilts. Lots of free patterns on the web, too. Elly's books are readily available at libraries and on the internet. I am not an applique person, but have looked through her books and are wowed! Good luck. Hope this info helps. Thanks, Anita! I just read some reviews of Volume 1, and it seems to be fantastic. Thanks, mandyrose. If/When I get to this I'll start off making just one relatively simple block, just to see how it goes. I'm not sure I'll ever be up to making a quilt where each block contains 100+ pieces. Here is another pattern with a different theme that could be fun for the sea lover. It is not the traditional look of these quilts though. So pretty. I think if it were in reds and greens it would have more of the "look." 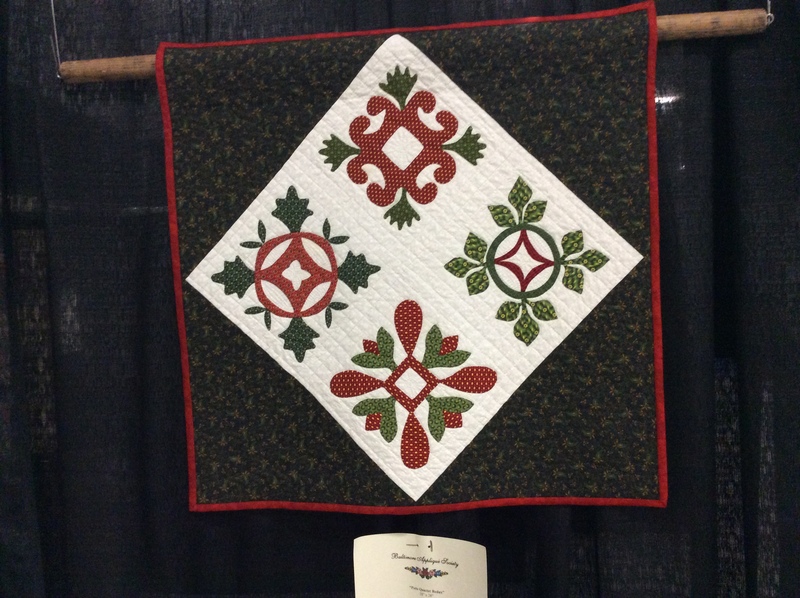 The Baltimore Appliqué Society website has patterns available, and will be having an online auction of tiny quilts in the fall. Many were displayed at the Mancuso Show in Edison NJ last month and they were beautiful. Once I saw the quilts in the Sienkiewicz books, I determined that I would make a Baltimore quilt some day. I started when I saw an invitation from Piecing the Past website to join their BOW to make Stars over Baltimore. It has some pieced star blocks mixed into the design and looked doable. I had to learn to applique, but I was planning to learn anyway and signed on. It has been a great experience. 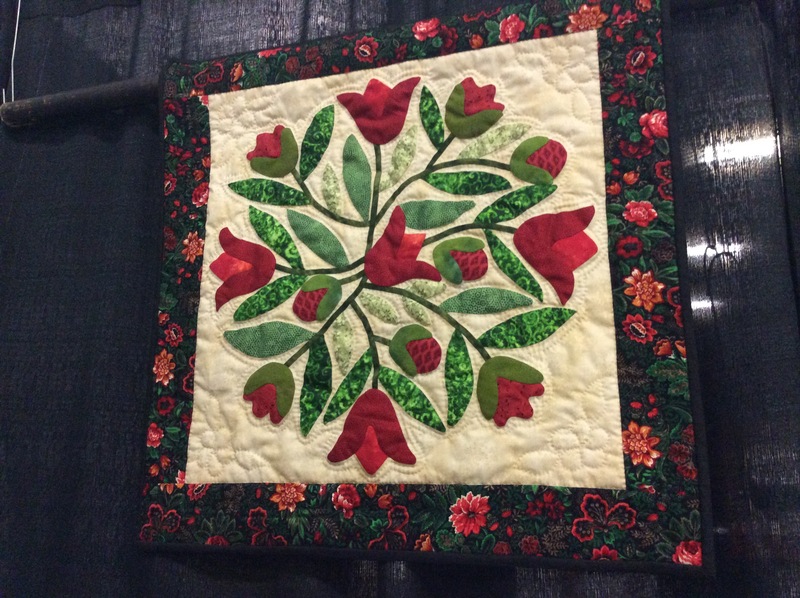 I have grown as a quilter by taking that step and although I am behind others who took the BOW challenge, I am progressing toward finishing with a great deal of pride and awe. I have collected as many of the Elly Sienkiewicz books as I can from used booksellers and am studying her cutwork applique right now in preparation for future quilts. Life is too short to shrink from challenges that take your breath away. I hope you will enjoy this next step as much as I have. This is a good (free) pattern to start with, if you are trying to decide if you like doing Baltimore Album designs. Any of Ellie Sienkiewicz's books would be great. I once took a Baltimore Album class and we worked straight out of her books. Good luck.